In this empirical study, we have examined the impact of knowledge management on organizational innovation capacity. Ultimate objective of existing research was to explore the role of knowledge management in encouraging innovation capacity in SMEs. Furthermore, this study also described role of knowledge management process to enhance knowledge repositories of SMEs. In order to understand knowledge management-innovation relationship, we collected data from SMEs across Azad Jammu and Kashmir. It was found that knowledge identification/creation, knowledge collection, knowledge organizing, knowledge dissemination, and knowledge application have positive and significant impact on innovation capacity of the SMEs in AJ&K. Implications of the study were also discussed. Knowledge Management (KM) is creation of knowledge, followed by knowledge organization, knowledge sharing, disseminating knowledge, knowledge application and use (Bhatt, 2001). KM is noteworthy factor of success for firms and a significant precursor for innovation (Bennett & Gabriel, 1999; Carneiro, 2000; Darroch & MacNaughton, 2002; Lin & Lee, 2005 Chilton & Bloodgood, 2010) and innovation is milestone of each firm (Carneiro, 2000; Plessis, 2007; Dilk et al., 2008). Nowadays, numerous firms and businesses deem that knowledge is mainly imperative affluence of their firms but practically they do not depend on it. Most central rational is that firms typically do not recognize that in what way they exploit knowledge. Though, there exists numerous models and approaches in KM; models efficacy relies on situations of organizations (Abtahi & Salavati, 2007). In spite of this, there are number of empirical studies have been conducted on KM as innovation precursor (Plessis, 2007; Chilton & Bloodgood, 2010), however, it is tricky to explore occupations that scrutinize empirical connection between constructs. Plessis (2007) outlined innovation as configuration of novel knowledge that assists businesses to create internal business procedures and arrangement more refined that create market suitable services and products. However, innovation does not come easy and KM is a significant contributor so far (e.g. Carneiro, 2000; Darroch and MacNaughton, 2002; Goh, 2005; Plessis, 2007; Chilton & Bloodgood, 2010). The field of KM is at its maturity (Abtahi & Salavati, 2007) and researchers have found that SMEs can benefit from KM strategies to innovate for competitive sustainability. The KM concepts, principles and practices have much to offer to the SME sector where scare resources, market agility, closeness to the customers and fewer layers are important (Darroch and MacNaughton, 2002). Improved KM can be really important in all these areas and can become a source of innovation, creativity and competitiveness in SME sector. Although much has been written on SMEs in knowledge management and innovation perspective (Beesley & Cooper, 2008; Hussain et al., 2010), however, only little has been explored to study SMEs sector in AJ&K (Hussain et al., 2010) and this study intends to address the existing knowledge gap. Further, it has also been revealed that little attention has been paid to uncover the knowedge sharing practices of SMEs (Chen et al., 2016; Ferraris et al., 2017; Scuotto et al., 2017; Tether & Tajar, 2008; Vrontis et al., 2017) and more importantly, a little attention has been paid to discover informal knowledge sharing among SMEs (Bonte & Keilbach, 2005). Newly established SMEs are facing immense competitive pressure and therefore, knowledge creation and knowledge sharing is inevitable for such SMEs to compete in ever changing environment (Damanpour & Aravind, 2012; Kim & Lui, 2015). Different firms adopt various KM practices to build up novel capabilities, so that they can ensure the progress towards superior performance (Hussain et al., 2010). However, some SMEs are still following traditional business models thereby compromising on change and innovation. The environmental adaptability of the SMEs can enable them to embrace technological changes to remain competitive (Gloet & Terziovski, 2004). In summary, our study aimed to explore (1) the role of KM factors in increasing innovation capacity of SMEs’ in AJ&K and (2) to investigate which KM processes are relatively more significant in shaping innovation capacity of the SMEs in AJ&K. Davenport and Prusak (2000) describe knowledge like: fluids combination of bounded knowledge, appropriate information, values, and knowledgeable imminent that offers support intended for estimating and integrating novel information and experience. Within firms, it frequently turns out to be entrenched not merely in repositories or documents, but also in organizational schedules, procedures, performs and customs. KM is a multidisciplinary field of study which covers various grounds. Knowledge is an important ingredient for many jobs now a days and sustainability of the businesses is heavily dependent on knowledge. Gloet & Terziovski (2004) described KM as admittance and formalization to knowledge, experience and proficiency that develop novel potentials, facilitate advanced performance and inspire innovation along with increase in customer value. Previous research have also explained KM under the expression of an umbrella on behalf of range of interlinking expressions. For instance, creation of knowledge, valuation and metrics of knowledge, mapping and indexing of knowledge, transport of knowledge, storage, distribution and sharing of knowledge. Definitions of KM are different based on reason for what purpose they’re proposed (Quintas et al., 1997; Greiner et al., 2007). Within other expressions, “KM might be described as an instrument that supports a firm’s strategic plan and its purpose” (Dove, 1999). Innovation has been defined in many distinct ways, however, according to (Goh, 2005) innovation is an intentional change in the existing products, services, ideas and operations new to the end user or unit of adoption. Creativity and innovation has become imperative for the survival in the competitive markets and firms in established industries investing heavily in R&D to stay competitive (Hayes et al., 2005). For most SMEs, to innovate constantly is the only remedy for survival. Previous research have shown the significant contribution of innovation and innovative strategies on market share and customer satisfaction (Chen & Huang, 2007). Therefore, it can be argued that innovation, if explored and exploited carefully can yield optimal benefits for SMEs also. Knowledge management is associated with knowledge development, regeneration, and exploitation to gain and maintain competitive advantage (Bhatt, 2000; Demarest, 1997; McCampbell et al., 1999; Soliman & Spooner, 2000; Wiig, 1997a, b). The researchers have described two measurements related to KM: upshots and properties. Three upshots are knowledge creation, retention and transfer. Three possessions of circumstance where KM seems accurate are components properties (e.g. an individual, a group, or an organization), relationships belongings among components (how components are associated among each other to effortless relocation of knowledge), and properties of knowledge itself (private vs. public, tacit vs. explicit etc.) (Argote, McEvily & Reagans, 2003). H 1 : Knowledge identification/creation has positive and significant impact on innovation capacity of SMEs. H 2 : Knowledge collection has positive and significant impact on innovation capacity of SMEs. Knowledge requires to be systematized for communities. In scheming tools to hold up organization regarding knowledge, commanding principle must be that of customer orientation and chief usage. Networking offers communications that make easy efficient and effective admittance to documents and information (Rowley, 2000). H 3 : Knowledge organizing has positive and significant impact on innovation capacity of SMEs. Alavi (2000) asserted that creating knowledge and novel knowledge might not be sufficient and procedures should be required to amass needed knowledge along with to retrieve it when desirable. Secretarial memory involves knowledge be inherent with a variety of constituent sorts which might involve written certification, pre-arranged in sequence stored in electronic databases, codified knowledge obtain from employees skills could be stored in expert systems, recognized processes and practices of organization, along with tacit knowledge needed by individuals and network (Tan et al., 1998). Memory of organizations involves memory of employees (experiences, observation and actions of persons) in addition to shared interactions and knowledge (Park, 2006), organizational culture (Van den Hooff & Van Weenen, 2004, Call, 2005), transformations, structure (formal roles of organizational), ecology (corporeal employment setting) and documentations of information (organization outside and inside) (Walsh & Ungson, 1991). All organizations those are willing so that their organizational knowledge to be obliged to as a minimum have an immense command of fundamental processes of knowledge management. Knowledge storage, however, remained question of concern for many contemporary organizations particularly (Olivera, 2000). The research is indicative of knowledge storage and innovation relationship and investigation suggested that knowledge storage can yield optimal benefits for organizations to gain and maintain competitive advantage (Sher & Lee, 2004). An arrangement that permits scheme to express rapid and correct information. Policies, events or procedures classifications depend on erudition needs. Capability to present precise and clear information. H 4 : Knowledge storage has positive and significant impact on innovation capacity of SMEs. H 5 : Knowledge dissemination has positive and significant impact on innovation capacity of SMEs. H 6 : Knowledge application has positive and significant impact on innovation capacity of SMEs. Innovation has been described as a vital element for growth (Volberda et al., 2014). Massa & Testa (2004) described that firms might enlarge receivers that expand or take up external knowledge and this action is strappingly associated with capacity of innovation. Additionally, these investigators stated that all the way through benchmarking, firms might attain tacit and explicit knowledge from external basis. These external knowledge sources could be integrated with internal explicit and tacit knowledge of organization if acquaintance gap overcomes which could be crammed from novel acquisition of knowledge that will be obliging to boost up innovation. Ju et al., (2006) mentioned that with the intention of attaining competitive benefit, firms should become skilled from external sources. All the way through appropriate distribution and sharing of knowledge, firms could boost up innovation. Therefore, firms must extend these channels inside firm from which workers share knowledge with other workers. Plessis (2007) and Schelfhaudt & Crittenden (2003) described that innovation is dependent on knowledge. Therefore, to boost up innovation, firms have to recognize capability of knowledge, and prosperity. Figure 1 illustrates the conceptual model of the study and relationships studied. The focal point of this empirical study was to recognize key procedures of knowledge management that influence innovation in SMEs’ sector of AJ&K. Current investigative study was a cross sectional study because data were collected one time only. Most business and management research fall into cross sectional category, however longitudinal and time lagged data are also preferred to avoid certain biases. For the aim to collect the data, we have used criterion-based assortment. In the present research, we have only included those SMEs focusing on innovation and change by personally visiting SMEs. Participants were conveniently selected from SMEs’ sector of AJ&K for the data collection from different districts of AJ&K. Data were collected through a self-administered questionnaire. A five point Likert scale was used for this purpose. As mentioned earlier, to address our research questions and achieve our research objectives, we have selected firms from AJ&K only. The respondents were chosen from managerial sector i.e. owners, manager, operational manager, and marketing managers. Prior to visits, milieu information on investigative project was sent to all contestants for greater in sequence and as an orientation throughout filling of questionnaires. Questionnaires were dispensed to be completed by managers and owners of the SMEs’ sector. A total of 212 questionnaires were distributed and from those 180 were received yielding 84.90% response rate. It is understood that any research methodology has its own challenges and this research study is no exception. A number of challenges were faced. Among those faced was the response rate for the survey. Although response rate is a concern for most surveys, however ability to report on it reflects the quality of the survey. Thus, taking this stance, both unit and item non-response were faced. Item non-response was faced such that in some cases, some questionnaires were only answered half way while in other questionnaires some questions were not attempted. For item non-response for questions that were not attempted at all, the researcher considered such questions as unanswered and labeled them “non-response”. On the other hand, unit response was more observed than item non-response, only one hundred and eighty (180) questionnaires were finally selected for further analysis (Table 1). i. Recognizing accessible knowledge and ability both external and internal to business organizations. iii. Encompassing procedure of acquiring and creating knowledge from diverse foundations for instance customers, employees, organizations and business partners. i. Gathering essential knowledge that is recognized from numerous sources. iii. Offering in sequence regarding what we know. i. Comprising appropriate strategy to evaluate knowledge on a customary foundation and maintain them advanced. ii. Encompassing procedures for cross listing, filtering and integrating diverse knowledge types. iii. Offering feedback to workers regarding appropriate knowledge. ii. Knowledge for effortless contact by all workers. i Comprising a sort of knowledge that is eagerly available to workers who require it. ii. Transferring out appropriate statements with suitable in sequence to workers. iii. Encompassing libraries, forums and resource centers to distribute and display knowledge. i. Encompassing diverse procedures for workers to further increase their knowledge. ii. Encompassing apparatus to guard knowledge internal and external to firms. iii. Applying knowledge to decisive spirited requires and rapidly linked sources. ii. Looking for novel methods to doing things. iii. Being inventive in use procedures. iv. Marketing novel services and products commonly. Mainly one variable along with different dimension has been used for the current study. Different dimensions of KM process were selected for the current study they are i.e. knowledge identification/creation, knowledge collection, knowledge organizing, knowledge sharing, knowledge dissemination and knowledge application. For the current research study, we decided to use the methods that were used by Mehrabani & Shajari (2012) to recognize impact of KM process on innovation capacity. In order to identify demographics characteristics of respondents, frequency analysis was utilized. As milieu information is major part of research, so it is commonly asked from the respondents. Respondents were asked to name the organization (optional) they work for, record their age and designation in demographic section. In order to obtain a holistic summary of the data and to sum up quantitative information, descriptive statistic is very helpful. It permits the user to acquire the brief summary of whole quantitative data. Control variables are held constant during testing the relationship between dependent and independent variable and help in measuring this relationship accurately. In the current study, three control variables were used such as name, age and designations of the respondents (Table 2). Table 3 reveals the age distribution of the respondents and shows that the age group 31–40, yielded 37.2% response (n = 67). At the same time as respondents encompass age in range of 20–30 (n = 54) are 30.0% and the respondents having 41–50 years of age are 22.3%, (n = 40). The lowest frequency and percentage comes out in age range of 61–70 are 2.2% (n = 4). Table 4 reveals the information regarding designation of the respondents. Almost 38.2% (n = 69) respondents were owners, 27.2% (n = 49) respondents were general managers and 18.3% (n = 33) respondents were manager finance. Whereas 9.4% (n = 17) were manager marketing and remaining 6.7% (n = 12) were manufacturing managers. Reliability of all measures was determined with the appropriate procedure suggested by Cronbach (1951). Nunnally & Bernstein (1994) suggested that the Cronbach’s alpha coefficient approximation for all measures must be .70. Table 5 shows that values of Cronbach’s alpha for variables used in the model. Through this, we explored the degree to internal consistency and the reliability as well. The Cronbach’s alpha for knowledge identification/ creation, Knowledge collection, Knowledge organizing, Knowledge sharing, Knowledge dissemination, Knowledge application and innovation is (.837, .783, .687, .759, .851, .822, .818 respectively). Therefore on the whole reliability of instrument is .794. Factor analysis were used on validated factors as a statistical tool to find the role of KM factors in increasing innovation capacity of SMEs in AJ&K. The principal components analysis with Varimax rotation is applied to uncover the latent dimensions of a set of indicators in the survey. Principal components analysis helps to reduce a large number of indicators to a smaller number of factors. For each category in the survey, we used Likert type five-point scales: 5 being “Strongly Agree” and 1 being “strongly disagree,” option. Table 6 reveals loading of Knowledge Identification/Creation factors, Knowledge Collection factors, Knowledge Organizing factors, Knowledge Storage factors, Knowledge Dissemination factors and Knowledge Application factors in determination of Innovation Capacity of SMEs in AJ&K. The table also reflects loading for innovation. As it is obvious from the table, constructs used for knowledge identification, knowledge collection, knowledge organizing, knowledge storage, knowledge dissemination and knowledge application were the main factors among KM factors and have acceptable factor loadings as well. Innovation constructs also have acceptable factor loading values. Recognizing accessible knowledge and ability both external and internal to business organizations. Demanding to regulate knowledge and capabilities of employees with necessary knowledge. Encompassing procedure of acquiring and creating knowledge from diverse foundations for instance customers, employees, organizations and business partners. Gathering essential knowledge that is recognized from numerous sources. Comprising appropriate strategy to evaluate knowledge on a customary foundation and maintain them advanced. Encompassing procedures for cross listing, filtering and integrating diverse knowledge types. Offering feedback to workers regarding appropriate knowledge. Exploiting repositories, databases and applications of information technology to accumulate. Knowledge for effortless contact by all workers. Exploiting numerous written mechanisms for instance manuals, newsletter to accumulate knowledge. Comprising a sort of knowledge that is eagerly available to workers who require it. Transferring out appropriate statements with suitable in sequence to workers. Encompassing libraries, forums and resource Centre to distribute and display knowledge. Encompassing diverse procedures for workers to further increase their knowledge. Encompassing apparatus to guard knowledge interior and exterior to firms. Appling knowledge to decisive spirited requires and rapidly linked sources. Looking for novel methods to doing passions. Being inventive in using procedures. Marketing novel services and products commonly. Descriptive statistics offer a practical outline of security revisits when performing analytical and empirical analysis. The descriptive statistics of SMEs’ sector is mentioned below (Table 7). In order to identify the correlation among the variables of research study, the Pearson product momentum correlation was used. The value of correlation for all variables is mentioned below. It indicates that there exists a positive and significant relationship among all variables. By adding control variable in step 1 and relevant independent variable in step 2 step-wise linear regression was executed. In order to assess the change in independent variable the value of R square was used. To identify that which variable is used as a control variable between dependent and independent variable one way ANOVA was conducted. For demographic variables, this test was executed and it was found that simply age has a noteworthy connection with dependent variable i.e. innovation in SMEs’ sector as shown in Table 8. The F value of age is 2.944 having significant level of 0.000 for SMEs. In step 1 of regression examination demographic variables, age was added as a control variable. In order to find out the variation in dependent variable i.e. innovation due to independent variable was entered in step 2. R square value reveals that appropriate variation in innovation is because of independent variables for SMEs’ sector. In order to explore overall strength of model F-statistics was executed. The values show that model possess significant overall strength for SMEs. On beta coefficient basis, the model depicts that increase in one unit of knowledge identification causes 23% of increase in innovation in SMEs sector and the value is significant. Similarly one unit increase in knowledge creation causes 21%, knowledge organizing causes 25%, knowledge storage causes 18%, knowledge dissemination causes 37% and knowledge application causes 38% variation in innovation. This shows that there exists a positive association between KM process and innovation in SMEs’ sector. So, all hypotheses are accepted as mentioned in the following table. From Table 9, it is revealed that there exists an encouraging and significant association between all steps of KM process (knowledge identification/creation, knowledge collection, knowledge organizing, knowledge storage, knowledge dissemination and knowledge application) and innovation in SMEs’ sector of AJ&K. In this sector there exists a constructive and significant impact of KM on innovation. The judgment regarding hypothesis of current investigative study are expressed in below mentioned table (Table 10). Knowledge identification/creation has positive and significant impact on innovation capacity of organization. Knowledge collection has positive and significant impact on innovation capacity of organization. Knowledge organizing has positive and significant impact on innovation capacity of organization. Knowledge storage has positive and significant impact on innovation capacity of organization. Knowledge dissemination has positive and significant impact on innovation capacity of organization. Knowledge application has positive and significant impact on innovation capacity of organization. In terms of knowledge creation and collection, it was found that the SMEs recognized the need for creation of both scientific and social knowledge if the benefits of the KM were realized. However, the SMEs sector appeared to be less advanced in this area, having a more mechanistic approach to knowledge creation and relying less on social interaction. These findings are consistent with the some previous studies (e.g. McAdam, 2001; Daneshfard & Mohammad, 2010). 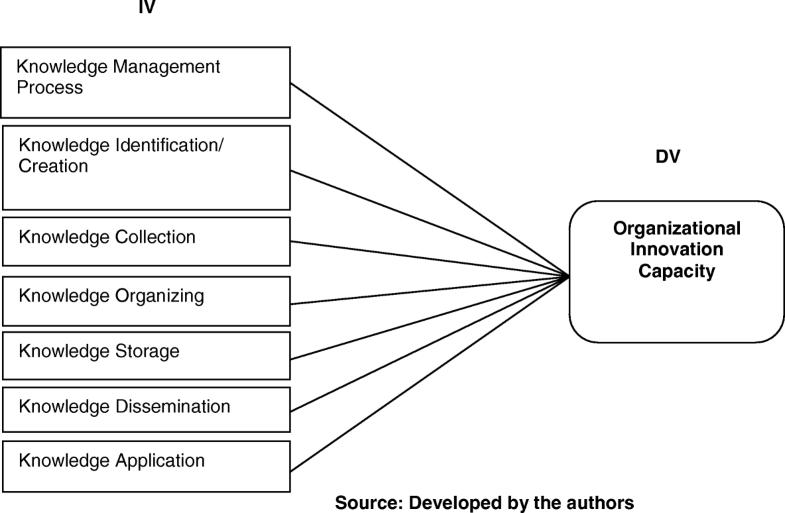 Knowledge organizing and storage were found to be highly dependent on employee interchange, employee interaction and mechanism of storage. The SMEs were found to be more dependent on people based knowledge organization and storage. The reason for this finding was the lack of resource for strategic business improvement planning within SMEs. These findings are consistent with the some previous studies (Demarest, 1997; McAdam, 2001; Sadler-Smith et al., 1998; Wilkes & Dale, 1998; Gray, 2006). Approaches to knowledge dissemination as part of a KM system were found to be mainly ad-hoc. There was little use of the more sophisticated methods available. SMEs sector relied more on people based approaches as mentioned earlier to disseminate knowledge across the organization. These findings are consistent with the some previous studies (Demarest, 1997; McAdam, 2001; Sadler-Smith et al., 1998; Wilkes & Dale, 1998; Sabherwal, & Becerra-Fenandez, 2003). The application of KM with in the SME studied was based mainly on reduced costs, and improved quality and efficiency. The SMEs sector responses were less, reflecting a current direct emphasis on market rather than business efficiency planning. These findings are consistent with the some previous studies (Demarest, 1997; McAdam, 2001; Sadler-Smith et al., 1998). Finally, it can be concluded that SMEs have much to gain by developing effective KM systems. The indications are that these systems are being developed to some degree, although a much more systematic approach is needed. The SME sector needs to develop their understanding of KM further as a key business driver rather than as a resource-intensive additional initiative. Nowadays, organizations because of ever changing environment and structure, lose adaptable responses. SMEs are required to innovate for sustainable competitive advantage (Barney, 1991). KM is proposed from organizational management role and organizational culture and also entity behavior. In an era where capacity of innovations as a competitive advantage is recognized to be connected to KM, substantial curiosity in accepting KM procedure persists to be inclination. Furthermore, KM procedure could affect innovation capacity in firms. A significant constituent of this considerate in numerous firms might be re-configuration of KM role in enhancing capacity of innovation, which requires to be examined by administrators. The ultimate focus of the current research was to investigate KM impact on innovation in SMEs sector of AJ&K. SMEs choice was depending on conviction that KM is noteworthy for business organizations, as a variety of sources of literature have designated. It must be illustrious that SMEs sector in Pakistan is mounting fast, donating a widespread variety of novel services and products. However, this sector in AJ&K needs lot of attention. Major giving of this research is that it might be an effort to see sights of KM environment in SMEs in AJ&K. The model reveals that KM process can have a constructive and noteworthy impact on innovation in SMEs’ sector of AJ&K. After careful analysis, it is concluded that although KM has positive and significant impact in SMEs’ sector. Moreover researchers can cover these issues in their investigative paper like superior sample size could be considered and additional KM practices might be exploited to explore role of KM and impact on innovation can be checked. Our study revealed that knowledge identification/ creation, knowledge collection, knowledge organizing, knowledge storage, knowledge dissemination and knowledge application is applied in SMEs’ sector to bring the innovation. The combination of all these can help SMEs to bring greater level of innovation in organization. The researchers have highlighted a basic map of how SMEs manage knowledge by utilizing these KM processes; however we do need to understand that SMEs have lot of problems and challenges, specifically in AJ&K. Future studies may focus on problems and challenges associated with KM adoption and implementation in SMEs. Comparatively, the research on KM and SMEs is rare as compared to such studies on large organizations. It is not factual to believe that SMEs adopt, implement and use KM in similar ways as larger organizations with the only difference being in magnitude or scale. The researchers believe that current study has opened up avenues for future research, by stressing some of the unique issues involved with KM processes at SMEs. Due to time and resource horizons present study was limited to a smaller sample of SMEs. Upcoming researchers are required to extend our findings, confirm them through a bigger sample, and even by adding some more variables. Authors acknowledge the participants of the study and their banks management for providing data. Authors also acknowledge the support of University of Kotli Azad Jammu & Kashmir for allowing us to move to market for data collection during official working hours. No specific funding for this research was provided by any funding agency. However, University of Kotli encouraged researchers to carry out this study and helped authors wherever, required. The datasets generated and/or analyzed during the current study are available and can be submitted if required. IH Contributed in all aspects in this study. However, his main contribution was in designing this study and then write-up. IH has worked on the background studies of the topic and finalized theoretical framework/ research model for the current study. AQ contributed in all sections, parts and steps of this study. Specifically, in data gathering. AQ helped in data collection as she was in close contact with SMEs because of her professional engagements with SMEs sector. She also worked on literature review section. GM also contributed in various parts of this research. Mainly he contributed in performing statistical tests and analyzing the results of the study. GM has significantly contributed in data analysis in SPSS and did results interpretation also. AW also remained an important part of this study all the time. However, his main contribution was in having critical literature analysis and building up theoretical part and hypotheses. MAW worked on data analysis and also wrote discussion section for this paper. ZI has worked on proof reading the manuscripts, and improved research methodology for the current study. He has also worked on answering reviewers comments. ZI has worked on proof reading the manuscripts, and improved research methodology for the current study. He has also worked on answering reviewers comments. All authors read and approved the final manuscript. Alegre, J., Sengupta, K., & Lapiedra, R. (2011). Knowledge management and innovation performance in a high-tech SMEs industry. International Small Business Journal available at: http://isb.sagepub.com/content/early/2011/10/11/0266242611417472. Tan, S., Teo, H., Tan, B., & Wei, K. K. (1998). Developing a preliminary framework for knowledge management in organization. AIS Electronic Library (AISeL). http://aisel.aisnet.org/amcis1998/211.